Investment in new infrastructural activities, rising electricity demand, surge in the construction and manufacturing sectors along with the development of independent power plants are some of the prime factors that would drive the growth of diesel genset market in South-East Asia. Amongst all South-East Asian countries, Indonesia, Philippines and Vietnam are expected to register highest market revenue share during the forecast period. Poor grid infrastructure and fluctuating electricity supply would also spur the market for diesel gensets in these countries. Some of the key companies in the South-East Asia Diesel Genset Market include - Caterpillar, Cummins, Denyo, Huutoan, Komatsu, Kohler, Mitsubishi, Yanmar, and MTU. 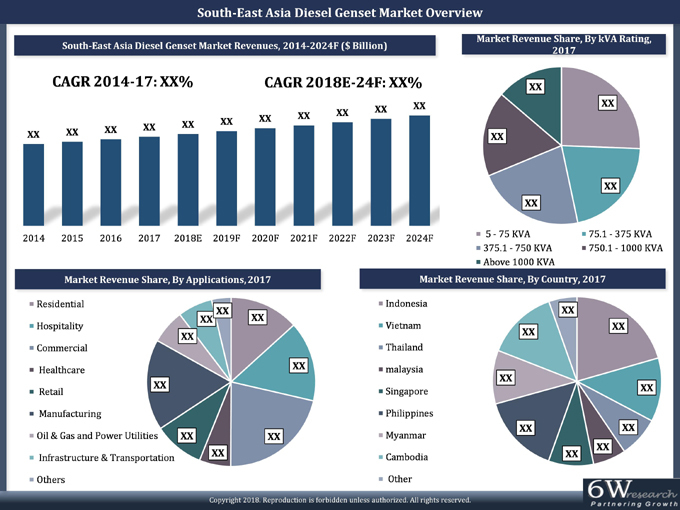 The report comprehensively covers the South-East Asia Diesel Genset Market by kVA Ratings, applications and countries. The report provides an unbiased and detailed analysis of the on-going trends, opportunities/high growth areas and market drivers which would help the stakeholders to device and align their market strategies according to the current and future market dynamics. 15.3 Denyo United Machinery Pte. Ltd.
15.4 Deutz Asia-pacific (Pte.) Ltd.
15.6 FG Wilson Asia Pte Ltd.
15.10 Mitsubishi Heavy Industries Engine System Asia PTE Ltd.
15.12 Yanmar Holdings Co., Ltd.